Director of NINES Andrew Stauffer and Project Manager Dana Wheeles will be joining the UVa Scholar’s Lab today to discuss Juxta Commons and possible uses for the software in the classroom. Below are a list of sets included in the demo to illustrate the numerous ways Juxta could draw students’ attention to textual analysis and digital humanities. Every now and then I like to browse the project list at DHCommons.org, just to get an idea of what kind of work is being done in digital scholarship around the world. This really paid off recently, when I stumbled upon Digital Thoreau, an engaging and well-structured site created by a group from SUNY-Geneseo. 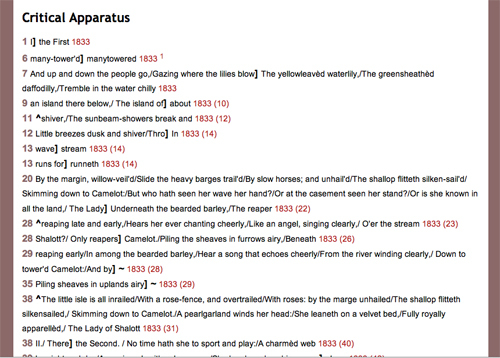 This project centers around a TEI-encoded edition of Walden, which will, to quote their mission statement, “be enriched by annotations links, images, and social tools that will enable users to create conversations around the text.” I highly recommend that anyone interested in text encoding take a look at their genetic text demo of “Solitude,” visualized using the Versioning Machine. What really caught my attention, however, is that they freely offer a toolkit of materials from their project, including XML documents marked up in TEI. This allowed me to take a closer look at how they encoded the text featured in the demo, and try visualizing it, myself. This embed shows the same text featured on the Digital Thoreau site, now visualized in Juxta Commons. It is possible to import a file encoded in TEI Parallel Segmentation directly into Juxta Commons, and the software will immediately break down the file into its constituent witnesses (see this example of their base witness from Princeton) and visualize them as a comparison set. Once you’ve successfully added the file to your account, you have access to the heat map visualization (where changes are highlighted blue on the chosen base text), the side-by-side option, and a histogram to give you a global view if the differences between the texts in the set. In this way, the Juxta Commons R&D hope to enable the use of our software in concert with other open-source tools. I should also note that Juxta Commons allows the user to export any other sets they have created as a parallel-segmented file. This is a great feature for starting an edition of your own, but it no way includes the complexity of markup one would see in files generated by a rigorous project like Digital Thoreau. We like to think of it the Parallel Segmentation and new experimental edition builder export as building blocks for future scholarly editions. Many thanks to the team at Digital Thoreau for allowing us to make use of their scholarship! Guest post by NINES Fellow, Emma Schlosser. The full set is embedded at the end of this post. Juxta Commons now offers a platform by which we can study the evolution of the most visited encyclopedia on the web—Wikipedia! The Wikipedia API feature allows users to easily collate variants that reveal changes made to articles, a useful tool when tracking the development of current events. In light of President Obama’s recent nomination of Senator John Kerry to be Secretary of State following Susan Rice’s withdrawal of her bid for the position, I decided to trace Wikipedia’s article on the September 11th 2012 attack on the U.S. consulate in Benghazi. The attack resulted in the tragic deaths of four Americans including Ambassador Christopher Stevens. In a September 16th version of the article, an editor adds that the U.S. government has begun to doubt whether a low quality and poorly produced film circulated on YouTube entitled Innocence of Muslims was in fact behind the attack. By September 22nd, an entire paragraph had been added to the “U.S. Government Response” section, including quotations from Senator John McCain (R, Arizona) who decried any claim that the attack was spontaneous: “Most people don’t bring rocket-propelled grenades and heavy weapons to demonstrations. That was an act of terror.” A September 27th version reports that Susan Rice appeared on five separate news shows on the 16th, asserting that the attacks were a “spontaneous reaction to a hateful and offensive video widely disseminated throughout the Arab and Muslim world.” The 27th variant also affirms that the Benghazi attack had become a politically fueled issue during the heated presidential race. The October 28th variant cites under the “Criticism of U.S. Government Response” section that Senator McCain specifically accused the administration of using Susan Rice to cover the true motives of the attack. As the progression of this Wikipedia article shows, the U.S. government response to the Benghazi attack overshadowed, to some degree, the causes and nature of the attack itself. This, of course, had much to do with the then raging U.S. presidential campaign. Rice’s tangential role in the response to the Benghazi attack, as evidenced by the paucity of references to her within the article, implicitly reveals the nature of political scapegoating. Thanks to Juxta’s Wikipedia API feature it was easy for me to trace the evolution of an article on a contemporary controversy, revealing the methods by which we continually modify and interpret our understanding of current events. For all those attending the Modern Languages Association Conference in Boston this year, please join NINES Directory Andrew Stauffer and Performant Software for a reception in the exhibit hall (Booth 717) on Saturday, January 5. 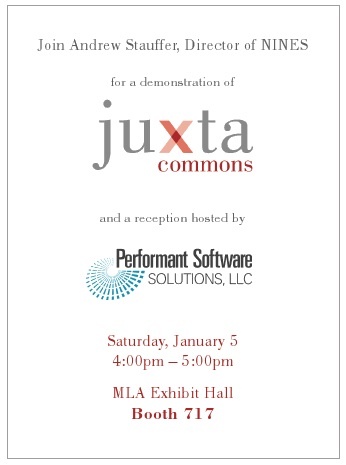 We’ll be running demos of Juxta Commons and answering your questions about NINES, Juxta and digital humanities software in general. Congratulations to Tonya Howe, the winner of our Juxta Commons sharing competition, leading up to the MLA Conference in Boston (#MLA13). 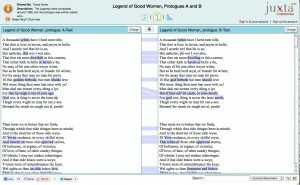 Be sure to have a look at the side-by-side view of her comparison set, Legend of Good Women, Prologues A and B.
We’ll be featuring the set in the Juxta Commons gallery in the very near future, along with some of the other sets that received lots of interest in the last month. As the Juxta R&D team has worked to take the desktop version of our collation software to the web, I’ve found myself thinking a great deal about the critical apparatus and its role when working with digital (digitized?) texts. 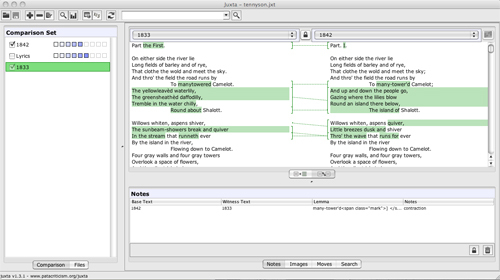 In the thumbnails above, you can see a page image from a traditional print edition (in this case, of Tennyson’s poetry) on the left, and a screenshot of the old Juxta critical apparatus output on the right. In the original, downloadable, version of Juxta, we allowed users to browse several visualizations of the collation in order to target areas of interest, but we also offered them the ability to export their results in an HTML-encoded apparatus. This was an effort to connect digital scholarship to traditional methods of textual analysis, as well as a way to allow scholars to share their findings with others in a familiar medium. It has become clear to me, based on the feedback from our users, that this HTML critical apparatus has been quite useful for a number of scholars. 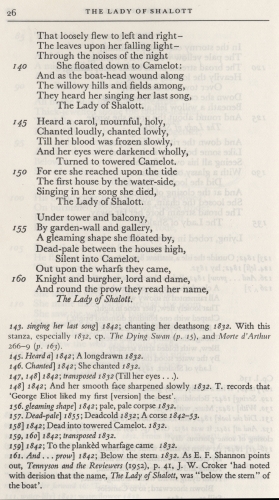 Even though our output could seem cryptic without being paired with the text of the base witness (as it is in the Tennyson edition), it was apparent that scholars still needed to translate their work in Juxta into the traditional format. 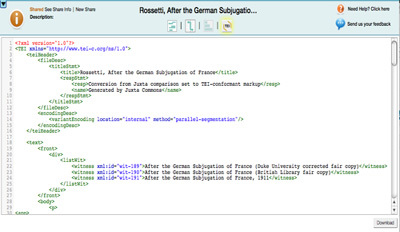 In the meantime, scholars working with the Text Encoding Initiative (TEI) developed Parallel Segmentation, a method of encoding the critical apparatus in XML. In her article, “Knowledge Representation and Digital Scholarly Editions in Theory and Practice,” Tanya Clement describes the effectiveness of using parallel segmentation to encode her digital edition of the work of the Baroness Elsa von Freytag-Loringhoven. 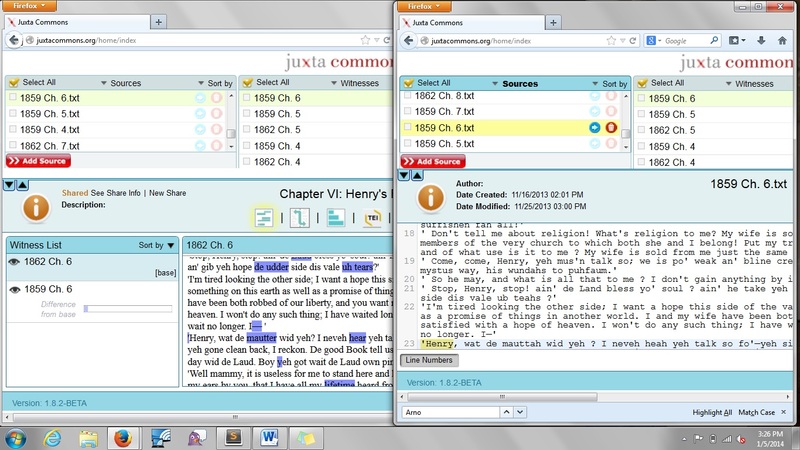 Using a TEI apparatus along with a visualization tool called the Versioning Machine, Clement argued that her project “encourage[d] critical inquiry concerning how a digital scholarly edition represents knowledge differently than a print edition,” and illustrated the flexibility of working with full texts in tandem. Witnesses, or alternate readings, were not subsumed under a (supposedly static) base text, but living, dynamic representations of the social and cultural networks within which the Baroness lived and wrote. Working with digital texts can make generating a critical apparatus difficult. One could encode your apparatus manually, as Clement did, but most users of Juxta wanted us to take their plain text or XML-encoded files and transform them automatically. The traditional apparatus requires exact notations of line numbers and details about the printed page. How does one do that effectively when working with plain text files that bear no pagination and few (if any) hard returns, denoting line breaks? Instead of hurriedly replicating the desktop apparatus online –knowing it would posses these weaknesses and more — the R&D team chose to offer TEI Parallel Segmentation output for Juxta Commons. 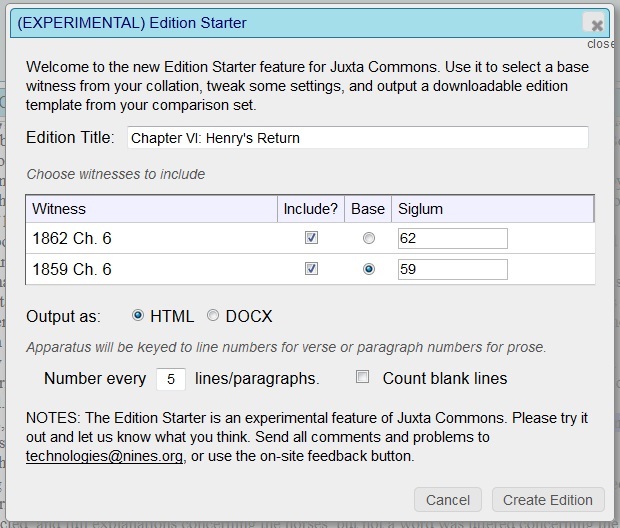 Any user of Juxta Commons can upload a file encoded in TEI Parallel Segmentation, and see their documents represented in Juxta’s heat map, side-by-side, and histogram views. Those working with plain text of XML files can also export the results of their collations as a downloadable TEI Parallel Segmentation file. In short, Juxta Commons and can both read and write TEI Parallel Segmentation. However, we’re not convinced that the traditional apparatus has lost its functionality. We’d like to ask you, our users, to tell us more about your needs. How do you use the critical apparatus in your studies? What other kind of apparatus could we offer to streamline and enhance your work in Juxta Commons? In September of 2008, when I first became acquainted with Juxta as a collation tool, I wrote a blog post as a basic demonstration of the software. 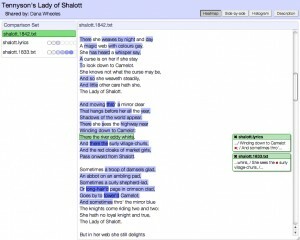 I hunted down transcriptions of two versions of one of my favorite poems, Tennyson’s “The Lady of Shalott,” and collated them alongside the abbreviated lyrics to the song adapted from work by Loreena McKennitt. Screenshots were all I had to illustrate the process and its results, however – anyone interested in exploring the dynamic collation in full would need to first download Juxta, then get the set of files from me. We had a great tool that encouraged discovery and scholarly play, but it didn’t facilitate collaboration and communication. Now, in 2012, I can finally show you that set in its entirety. The dream of Juxta for the web has been a long time coming, and we couldn’t have done it without generous funding from the Google Digital Humanities Award and support from European scholars in the COST Action 32 group, TextGrid and the whole team behind CollateX. As Project Manager, I’m thrilled to be a part of the open beta release of the Juxta web service, accessed through version 1.6.5 of the desktop application. I imagine at this point you’re wondering: if I want to try out the web service, do I still have to download the desktop application? Why would I do that? Over the past year, our development team’s efforts have been directed to breaking down the methods by which Juxta handles texts into ‘microservices’ following the Gothenberg Model for collation. We designed the web service to enable other tools and methods to make use of its output: in Bamboo CorporaSpace, for example, a text-mining algorithm could benefit from the tokenization performed by Juxta. We imagined Juxta not just as a standalone tool, but as one that could interact with a suite of other potential tools. That part of our development is ready for testing, and the API documentation is available at GitHub. However, the user workflow for Juxta as a destination site for collations on the web, is still being implemented. Hence this new, hybrid beta, which leverages the desktop application’s interface for adding, subtracting and editing documents while also inviting users to share their curated comparison sets online. This is where you come in, beta testers – we need you to tell us more about how you’d like to user Juxta online. 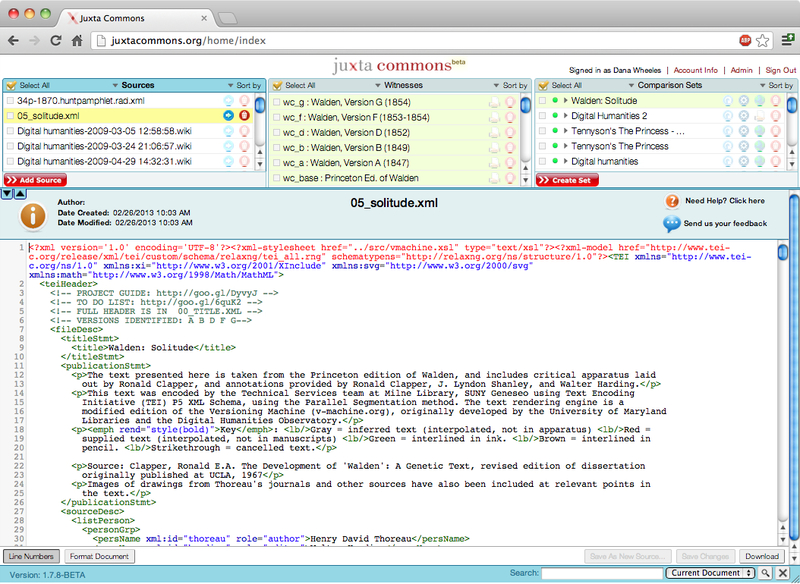 We know that collation isn’t just for scholarly documents: we’ve seen how visualizing versions of Wikipedia pages can tell us something about evolving conversations in Digital Humanities, and we’ve thought about Juxta’s potential as a method for authenticating online texts. But as we design a fully online environment for Juxta, we want to get a better sense of what the larger community wants. I want to thank everyone who has set up and account and tried out the newest version. We’ve seen some really exciting possibilities, and we’re taking in a lot of valuable feedback. If you’ve held off so far, I ask that you consider trying it out. But I don’t have any texts to collate! No worries! We’re slowly populating a Collation Gallery of comparison sets shared by other beta testers. You might just find something there that gets your creative juices flowing. Over the past few months, NINES and the developers of Juxta have been busy adapting the application for use on the web. In order to expand our testing capabilities, we’re releasing a version of the desktop client that offers users the ability to share comparison sets online. If you have any sets of witnesses to a particular work that you would like to collate and share, we invite you to sign up and download the beta version to try out some of our online features. Please keep in mind that this is a trial version of the web-service, and may be subject to changes and updates over the next few months. Joining us now ensures that your feedback will make the full release of the software better than we could manage in-house. Please help us make Juxta better! Great news! Juxta is at the center of a new partnership agreement between NINES and the Modernist Versions Project (MVP). The agreement provides the MVP with programming support to integrate Juxta with a digital environment for collating and comparing modernist texts that exist in multiple textual variants. The MVP, a project based at the University of Victoria, will enjoy full access to the Juxta collation software, including the existing stand-alone application and the web service now under development. The MVP is expected to provide a robust environment for testing and enhancing both versions of Juxta.